An enterprising robotic explorer will smash into the lunar frontier Friday in search of water ice hidden deep inside the darkest corners of the moon, spewing hundreds of thousands of pounds of dust high above the surface in a celestial event visible from Earth. Just four minutes will decide the outcome of three years of preparations, four months of space travel, and a $79 million investment put into the bold mission. Four minutes is the time that nine science instruments on the LCROSS probe will be able to directly study a cloud of dust thrown high above the moon by the impact of an empty Centaur rocket stage. LCROSS is "a very exciting mission culminating in a real crescendo event," said Dan Andrews, the project manager from NASA's Ames Research Center at Moffett Field, Calif. The sensors will scan the debris for the chemical signature of water, providing definitive proof for a decade-old hypothesis that ice exists on Earth's inhospitable companion. 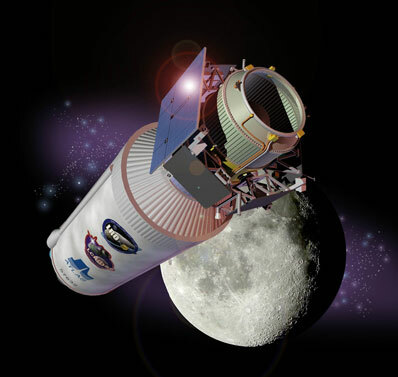 The Clementine and Lunar Prospector missions of the 1990s sensed elevated levels of hydrogen at the moon's poles. Scientists believed the hydrogen was from trapped water ice. The high concentrations were centered on permanently shadowed craters, lightless meteor impact sites that are unimagineably cold. "And by cold, I mean cold," says Tony Colaprete, the mission's principal investigator from Ames. According to scientists, temperatures at the bottoms of the craters could be as low as -240 degrees Celsius, or -400 degrees Fahrenheit. At those temperatures, water tends to freeze instead of sublimating into gas, Colaprete said. "At the poles, the sun never comes more than a degree-and-a-half or so above the horizon, so the crater rims can constantly shadow the crater floors," Colaprete said. The time scales are just as mind-boggling. "There are portions of the crater floors that are in permanent shadow. They could have been permanently shadowed for a billion or two billion years, maybe more," Colaprete said. Data from the Lunar Reconnaissance Orbiter, a counterpart to the LCROSS mission, have independently verified the presence of hydrogen, even hinting the potential water ice was more widespread than earlier thought. Scientists also announced last month that three spacecraft found evidence of water in lunar regions previously thought unable to support it. Those recent findings have set the stage for an experiment to "reach out and touch the water," said Mike Wargo, chief lunar scientist from NASA's exploration directorate. If LCROSS proves water resides on the moon, it could be a boon for engineers in the early stages of planning for a human return to the lunar surface. "It's certainly intriguing to know that there might be water deposits in places where you could go and live off the land versus bringing that water from Earth," said Todd May, the lunar robotic precursor program manager at the Marshall Space Flight Center in Huntsville, Ala.
Water could not only help quench the thirst of astronauts, but also supply oxygen, electricity and even rocket propellant for the return trip to Earth. NASA says the latest estimates predict impact at exactly 1131:30 GMT (7:31:30 a.m. EDT) Friday morning. That time could shift by a few seconds based on new navigation solutions in the coming days. Scientists have tapped Cabeus crater for the cosmic collision, a 60-mile-wide depression near the moon's south pole. 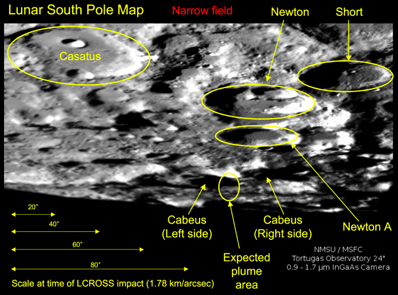 Cabeus was the subject of a late crater switch announced last week based on a recent analysis of results from LRO and Japan's Kaguya spacecraft. The LCROSS shepherding spacecraft, a six-sided platform built by Northrop Grumman Corp. using off-the-shelf parts, has been towing the Atlas 5 rocket's Centaur upper stage through deep space since its launch on June 18. Having been drained of its propellant and safed shortly after launch, the 41-foot-long, 10-foot-wide inert Centaur has a mass comparable to a large sports utility vehicle, according to Andrews. The two vehicles will part ways at about 0150 GMT Friday (9:50 p.m. EDT Thursday), according to NASA. After separating from the Centaur, the shepherding satellite will fire its engines to back away from the rocket. Lunar gravity will be pulling both objects toward the moon. "We burn some propellant and decelerate our inevitable acceleration into the moon to buy us time between the two impacts," Andrews said. The probe will open up to a distance of nearly 400 miles from the Centaur, equivalent to about four minutes of flight time between the vehicles. That will give the shepherding satellite enough time for its make-or-break chance to detect iron-clad evidence of water inside Cabeus. When the Centaur slams into the moon at 5,600 mph, it will excavate more than 350 metric tons of lunar regolith, throwing some of the material up to six miles above the surface and 30 miles away from the impact site. At that altitude, the debris will be exposed to sunlight and illuminated for the first time in ages. Scientists expect the Centaur to leave a crater some 66 feet wide and 13 feet deep. The Centaur will strike the moon nearly head-on, a much steeper angle than earlier impacts. The Lunar Prospector, SMART 1 and Kaguya probes ended their missions with controlled crashes at much lower angles, limiting the potential for valuable science data. Also rapidly plummeting to its own sacrificial impact, the shepherding spacecraft will spend the mission's four-minute climax giving scientists an up close view of what is inside the polar craters. Nine instruments, including five cameras, will be collecting data and beaming the information live back to ground controllers stationed at Ames. A video camera provided by Ecliptic Enterprises Corp. will capture live video and downlink the imagery at a few frames per second. Four more near-infrared and mid-infrared cameras will also monitor the debris cloud, gathering more detailed data on the thermal properties of the ejecta and looking for signs of water. Those imagers were built by Goodrich Sensors Unlimited, Thermoteknix Ltd. and the Indigo unit of FLIR Systems Inc.
Three spectrometers attached to telescopes will be the workhorses of the instrument suite to determine the precise composition of the lunar dust. Colaprete said their results will be the most definitive of the mission. A photometer aboard LCROSS will also measure the brightness of the Centaur's fiery impact about 1,000 times per second, creating a highly-detailed light curve of the luminance of the flash. The mission's entire catalog of data will be streamed live to the science operations center because the LCROSS probe is destined for its own smaller destructive crash. "There's nothing left of LCROSS when it's done, just the data that was sent out," Andrews said. The shepherding spacecraft should strike the moon at 1135:45 GMT (7:35:45 a.m. EDT), according to early estimates. "The impact sounds spectacular, and it will be. But you have to consider impacts of this size hit the moon three or four times a month, essentially once a week," Colaprete said. "What's unique about the LCROSS impact is we know exactly where and when, so we can actually get and coordinate all of these eyes to look at it." Those eyes not only include LCROSS, but also instruments on LRO, the Hubble Space Telescope, and the Earth Observing 1 technology demonstration satellite. Sweden's Odin radio astronomy satellite and the commercial GeoEye spacecraft, primarily used for Earth imagery, will also turn toward the moon for supplemental observations. A network of telescopes on Earth will also play a critical role. The W.M. Keck Observatory, Gemini North Telescope and Infrared Telescope Facility in Hawaii are slated to study the ejecta plume when it comes into view. Other facilities in California, Arizona and New Mexico are also primary participants in the impact event. In addition to other international observatories, officials have put together a loosely-organized group of amateur astronomers and watch parties to collect extra data and engage the public. Mission planners timed and positioned the impact to be in view of much of the United States. Observers west of the Mississippi River will be most favored. Weather permitting, modest telescopes with apertures of 10 to 12 inches could catch a glimpse of the stream of rock and possible ice thrown into space by the event. The LCROSS impact will also occur with a nearly full moon high in the skies of the ground observation sites, maximizing their potential scientific return. 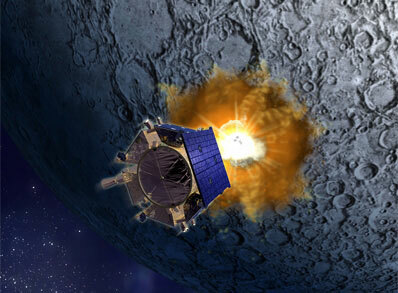 LCROSS, which stands for the Lunar Crater Observation and Sensing Satellite, was chosen from 19 proposals to fill extra space on the Atlas 5 rocket that was to launch the much larger LRO mission. Officials announced LCROSS would join the LRO launch in 2006. The missions finally got underway three years later. LRO entered orbit around the moon four days after launch, while LCROSS and the attached Centaur swung by the moon into an ultra-high Earth orbit to wait for its much more dramatic lunar appointment. The spacecraft is fine-tuning its trajectory toward the moon with a series of small thruster firings. Two more burns are planned before the satellite releases the Centaur, and a third burn called a braking maneuver will back the probe away from the rocket body. A software glitch in August caused the craft to burn nearly half of its propellant, putting the probe in jeopardy for a few weeks until controllers could ensure a similar problem would not doom the mission. "Having survived this test and emerged with the moon and full mission success still in our sights was quite an accomplishment," said Paul Tompkins, an LCROSS flight director, in a blog posting Sunday.